For a printable copy of the above form, please click HERE. Come get your auto cleaned, dried, and vacuumed while supporting a great program: FSHS Boys Golf! Special thanks to Typhoon Bay Car Wash for sponsoring this event and providing supplies! Lynette Jackson, a second-grade teacher at Winfield Scott Elementary School, is retiring after 31 years in education. 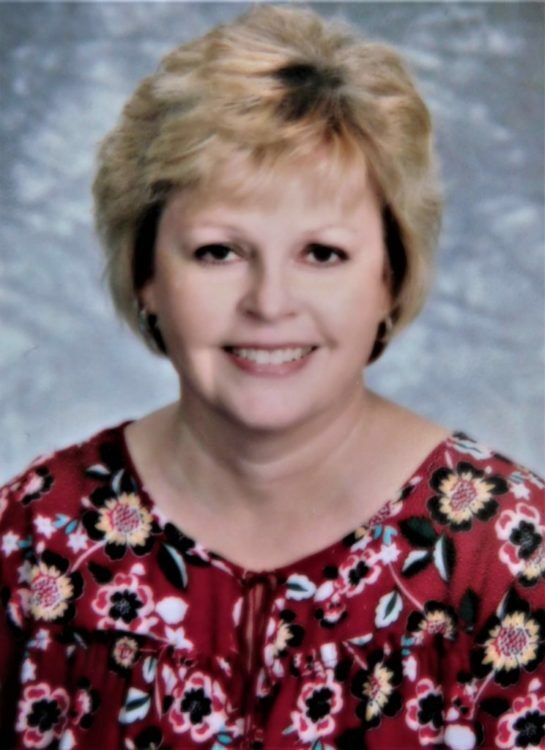 “I taught first grade for one year in Shawnee, Oklahoma and thirty years have been with USD 234 as a K-3 teacher and instructional coach,” Jackson said. 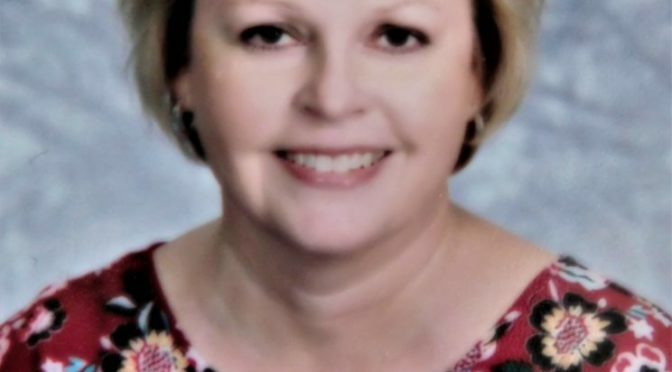 Born and raised in Fort Scott, she earned her Bachelor of Science in Education and Masters Degree in Elementary Education from Pittsburg State University. 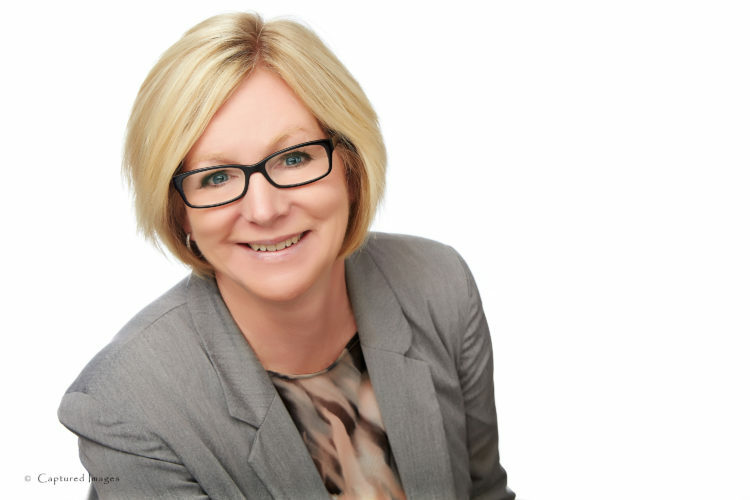 Several factors influenced her to become a teacher. “One was the relationships I had with my former teachers,” she said. “I have great memories of school because my teachers made school fun and exciting. They also made me feel very secure and important. Although I’ve enjoyed school throughout my lifetime, my elementary years are the most memorable to me. Therefore, I became an elementary teacher. Jackson believes a teacher has a mission. Jackson has had the privilege to work with colleagues that were past students. As with all professions, there have been challenges. 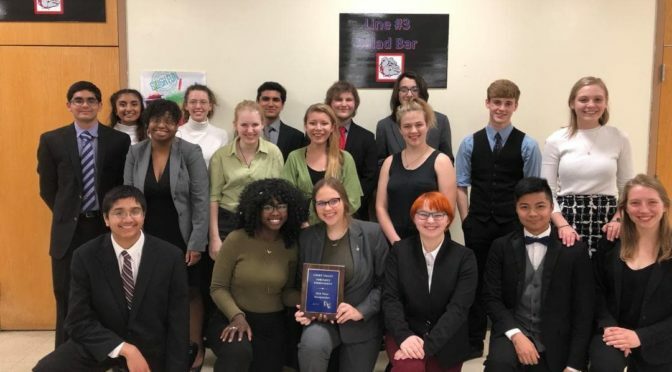 The South Kansas District completed their last National Qualifier of the season at Pittburg High School on Saturday April, 13, and Fort Scott HS qualified four more members to Nationals. 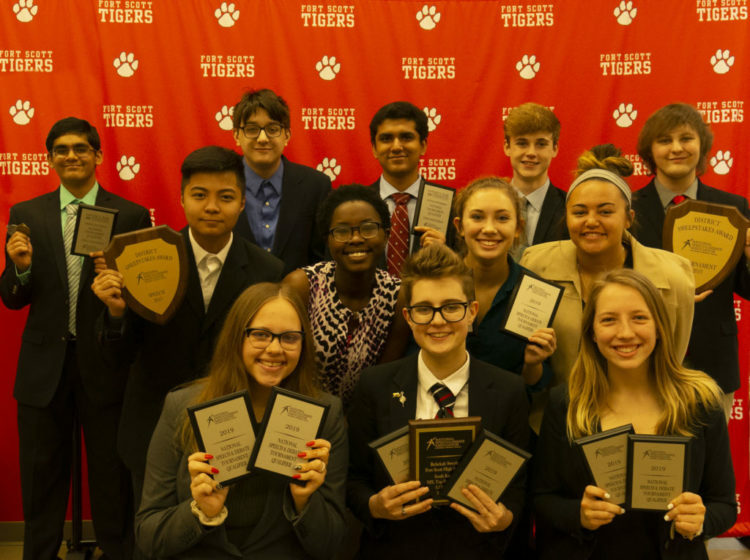 Congratulations to the 2019 National Qualifiers who will be competing in Dallas, Texas, June 17-21. 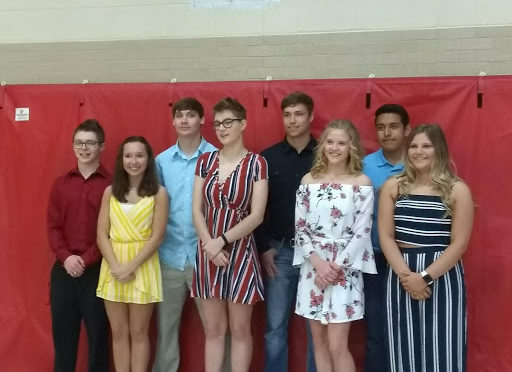 If you see these students please congratulate them! 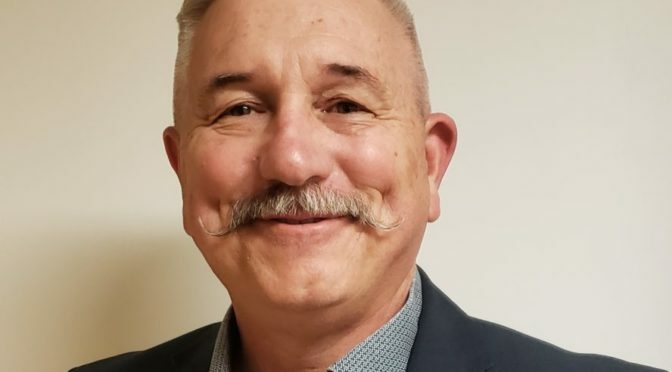 David Brown, 55, was recently hired by USD 234 to be the Fort Scott Middle School Principal. Brown is a Fort Scott native. 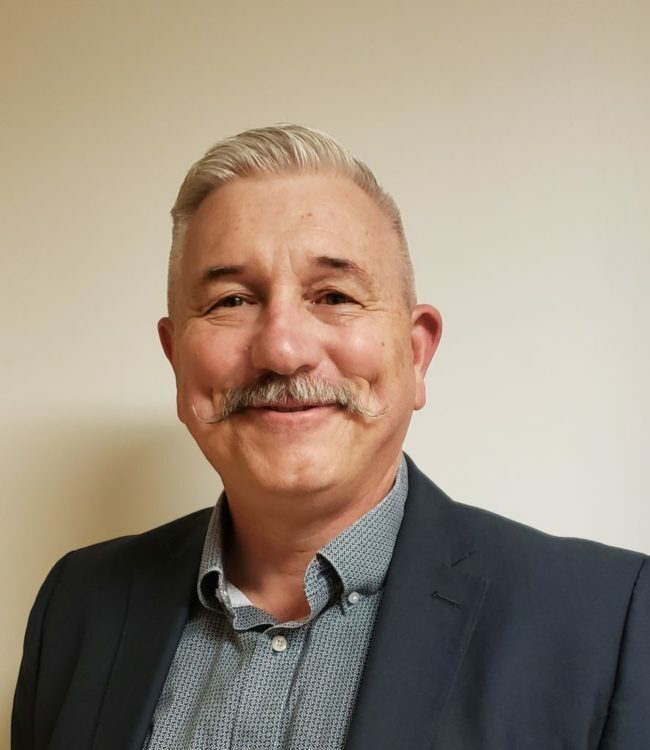 He is a 1981 Graduate Fort Scott High School, 1982 Graduate Fort Scott Community College, 1985 Graduate Baker University Bachelor of Science in Physical Education and History, and in 2015 he graduated from Pittsburg State University with a Master of Science in Educational Leadership. Brown’s first love was coaching and to coach is to teach, he said. He believes education is facing a challenging future. Brown is married to Stacy and has four daughters: Cori, Morgan, Addi, and Riley. Teachers at Fort Scott Christian Heights School. 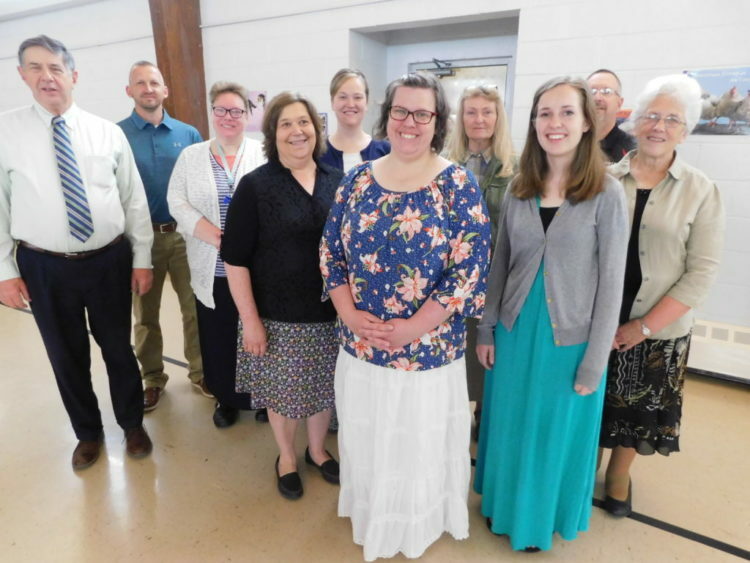 From left: Terry Chance, prinicpal; Jeremy Budy, history teacher; Larissa Hunter, pre-school and kindergarten teacher; Karen Schellack, 7-8 grade; Julie Going, 1-2 grade; Sarah Pridey, English; Esther Arnold, 3-4 grade; Amanda Bachand, 5-6 grade; Larry Davolt, science; and Jan Beltram, secretary. 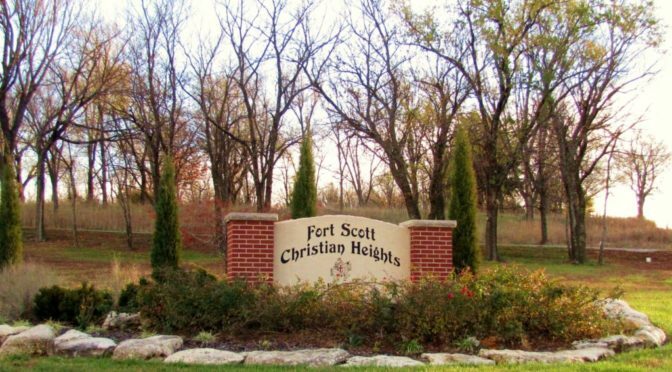 Terry Chance, principal of Fort Scott Christian Heights School, told the Fort Scott Chamber of Commerce weekly coffee attendees that the school was started in 1947. The school educates children pre-school through grade 12. 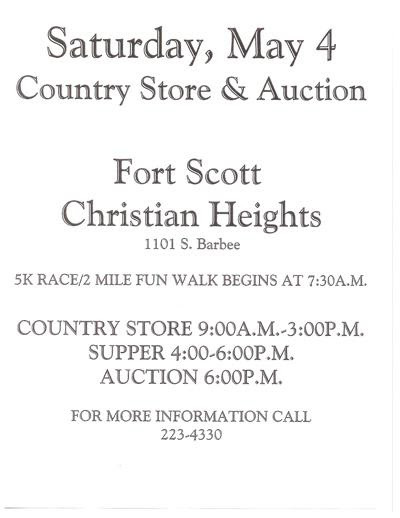 To help support the school, each year a Country Store event happens at the school, located at 1101 S. Barbee. This year it is May 4. The Country Store includes a rummage sale from 9 a.m. to 3 p.m., a supper from 4-6 p.m. and an auction at 6 p.m. Chance thanked the businesses in town who contribute prizes, including silent auction items that help make the fundraising event successful. Terry Chance speaks at the Fort Scott Chamber of Commerce weekly coffee on April 11. In back ground is the Chamber Announcer Robert Uhler. 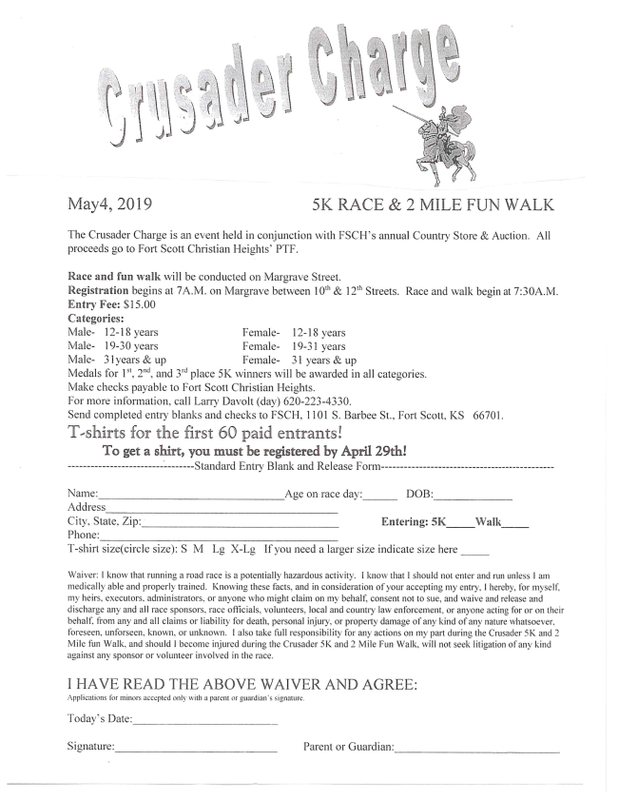 Prior to the Country Store event, the school offers a Crusader Charge, which is a 5K race and two-mile fun walk for persons 12 through 31-plus years old. The race will be conducted on Margrave Street. The entry fee is $15, with t-shirts free for the first 60 paid entrants. For more information contact Larry Davolt at 620-223-4330. The Kids Fun Run and Obstacle Course is for children 6th grade and younger, and includes water balloon carry, gunny sacks, jump ropes and more. Participants who pre-register by April 29, will receive a t-shirt and concession stand voucher. The entry fee for this is $15. For more information contact Lacey Avery at 913-375-7608. The kids event starts at 10 a.m. at the south entrance to the school. Applications can be picked up at the school. Play time is 7 p.m. on Friday, April 12 and Saturday, April 13. Chamber members converse before the announcement segment of the weekly coffee at Fort Scott Christian Heights School on April 11. 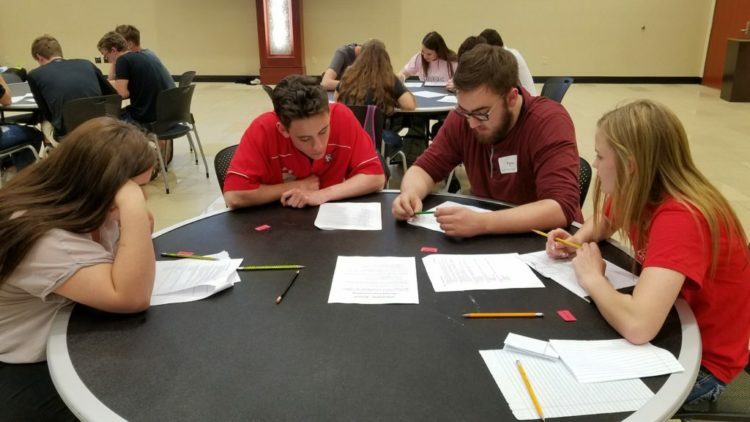 These students were among 18 other teams competing for the opportunity to represent Kansas at the National Completion in Lincoln Nebraska. Students had to first complete a preliminary test. The top 20 teams in Kansas were then invited to Wichita State University to compete in the state championships. Once at the tournament, students competed in three individual and one team test. 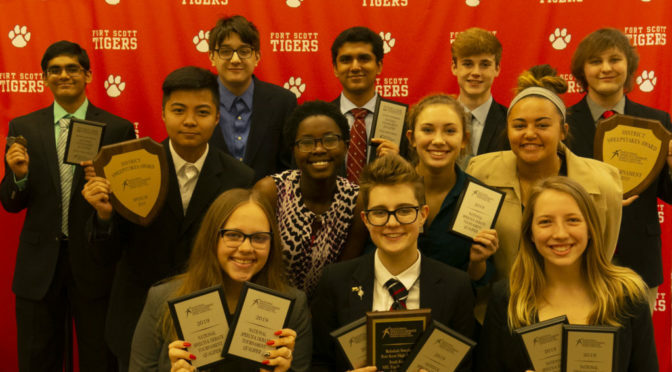 While not qualifying for Nationals, the FSHS team was in the top five teams across the state. This activity was part of the Personal Finance class taught by Bert Lewis at the High School. 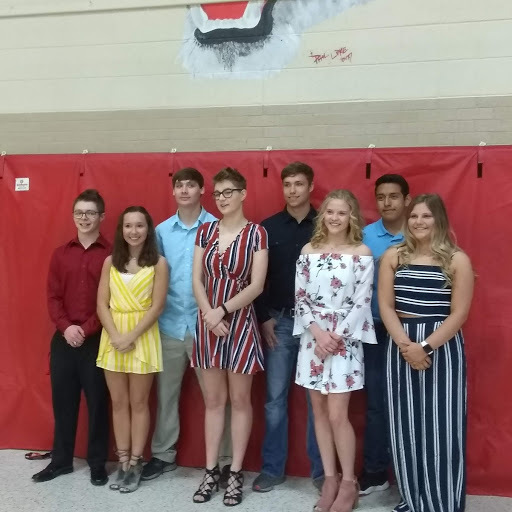 Fort Scott High School Homecoming 2019 candidates are front: Kelcie Bailey, Rebekah Sweyko, Shaylee Terry, Karli Wright; back row: Johnathan Gauthier, Nicholas Krebs, Gage Lamb, and Alan Santana. Fort Scott High School Prom 2019 is this Saturday, April 13 at the River Room, 3 West Oak Street where it intersects with North National Avenue. The public may view the prom site indoors from 4:30 to 5:30 p.m.
“Parents will be able to set up chairs, or watch from sides of the street,” she said. The promenade walk-in is from 6:30 to 8 p.m. 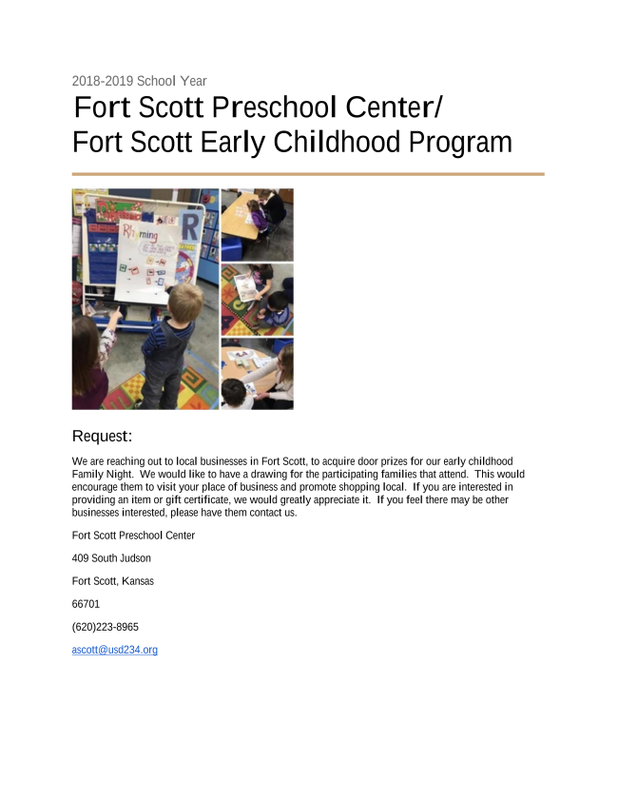 The prom is from 8:00 to 11:00 p.m.
We are reaching out to local businesses in Fort Scott, to acquire door prizes for our early childhood Family Night. We would like to have a drawing for the participating families that attend. If you are interested in providing an item or gift certificate, we would greatly appreciate it. 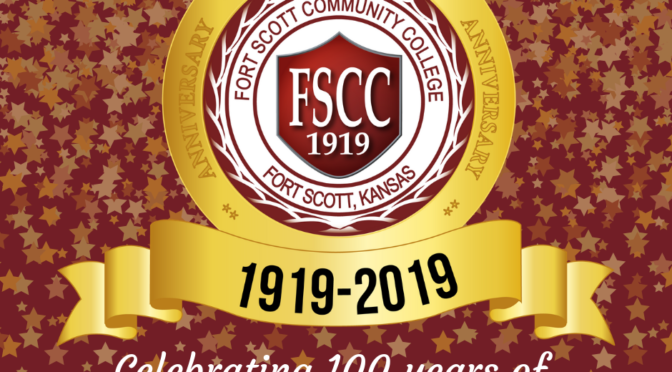 Alysia Johntson announced the Centennial Celebration of Fort Scott Community College at the Fort Scott Chamber of Commerce weekly coffee Thursday at the college gym. 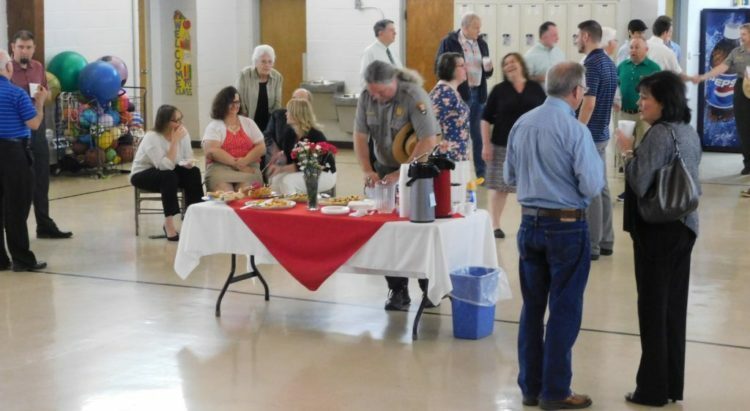 The school is oldest continually operating community college in Kansas and will celebrate one hundred years of existence September 20 and 21, Johnston told the coffee attendees. Fort Scott Community College President Alysia Johnston. 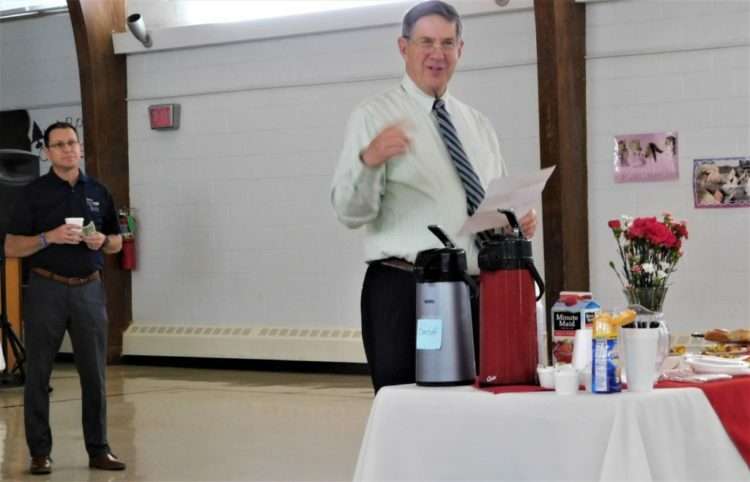 “Fort Scott Community College started in Fort Scott High School in 1919,” Johnston told the coffee attendees. That move allowed students who wanted to start college, but not have to go out of the community, to attend college, said Mert Barrows, a member of the Centennial Committee. The college moved to the present site on South Horton Street in 1967, Johnston said. “Today we provide online degrees and also have one of the best occupational areas around,” Johnston said. “I was a student here for the 50th anniversary (of the college),” Harold Hicks, Centennial Committee Chairman, said. To celebrate the centennial, there is a banquet and tailgate party planned for the community. The celebration will kick off Friday evening, September 20, with a banquet for graduates, employees, and their families, according to a press release from FSCC. Saturday afternoon, Sept. 21, will feature a tailgate party at the stadium for all members of the community and conclude with the Homecoming game at 7 p.m.
Other activities planned include the burial of a time capsule, a series of featured articles in the newspaper, display cases around the campus, cake celebration, a video depicting campus activities, and appearances at local fairs and other community events, and other activities in the works, according to the press release. 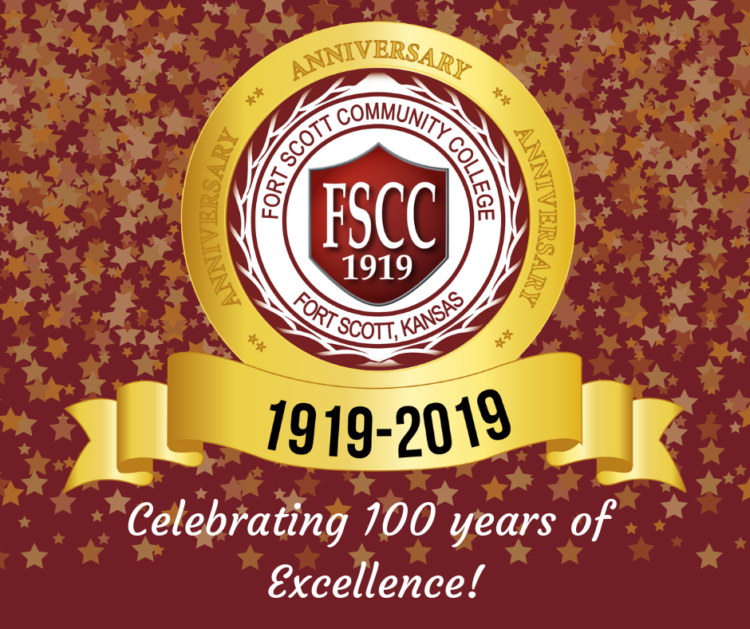 Fort Scott Community College (then Fort Scott Junior College) was voted into existence on November 8, 1918, in a city-wide election. Rees Hughes, principal at Fort Scott High School, administered the newly formed college with fully qualified teachers to teach a program of consisting of foreign languages, English, mathematics, and science that would be identical to that offered by the University of Kansas, according to the press release. According to a Fort Scott Tribune article published in April 1918, “By establishing the two years of college work in Fort Scott, it offers an unusual opportunity for students in Fort Scott and Bourbon County and adjacent counties to secure two years of normal school or college work while near home. 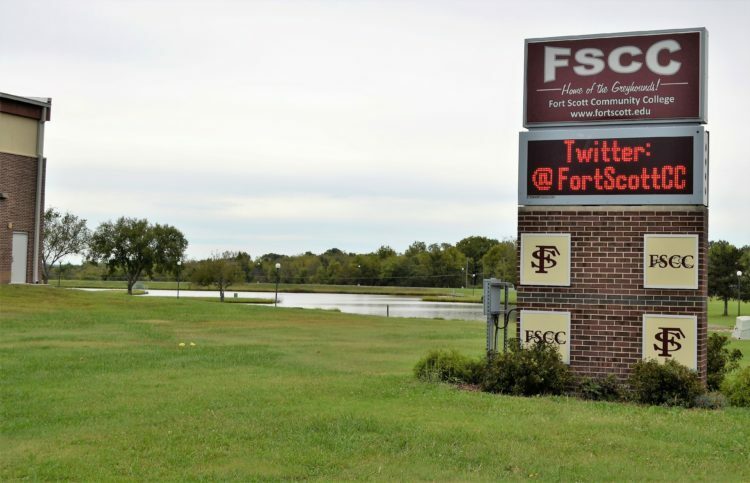 The work done in the Fort Scott Junior College will be fully accredited at any of the colleges, normal schools or universities of the state,” according to the press release. Centennial Committee members: Hicks, Barrows, Carolyn Sinn, Valetta Cannon, Bernita Hill, Robert Nelson, Bob Cable, Lori Cable, Rhonda Bailey, Ellen Fairchild, Leslie Damien, Karri Johnson, Marcel Normand and Kassie Feugate-Cate. Fort Scott, KS Apr. 1, 2019— Fort Scott High School celebrated Theatre in Our Schools (TIOS) Month throughout March. The Thespian troupe planned a number of activities for both students and the community and travelled around the state to perform. 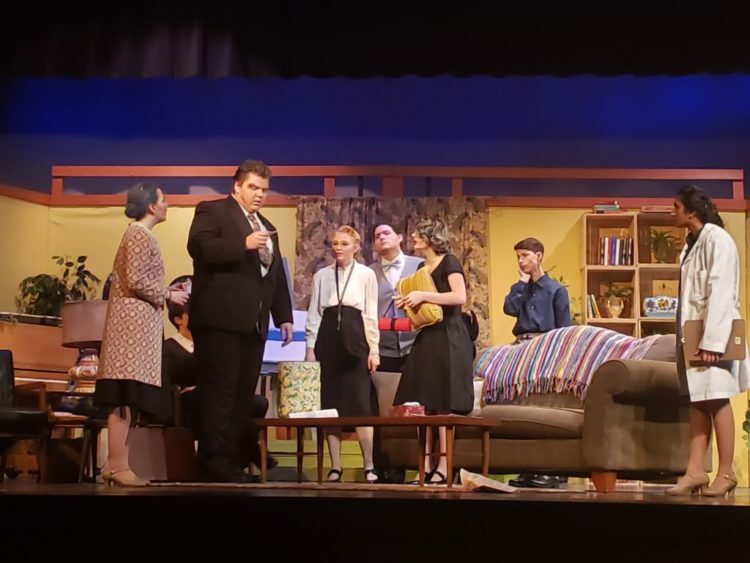 The troupe partnered with Fort Scott Community College to host a dinner theatre production of “Prescription Murder” at Ellis Performing Arts Center with all proceeds donated to the FSHS Thespian trip to the International Thespian Festival this summer. 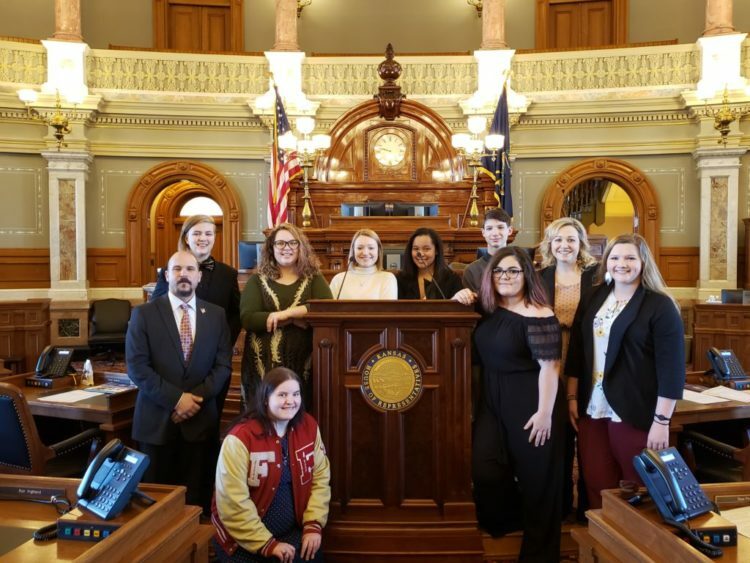 Thespian troupe leaders attended the Theatre Education Advocacy Day at the capitol in Topeka on March 11 to meet with Representative Trevor Jacobs and other state student leaders. 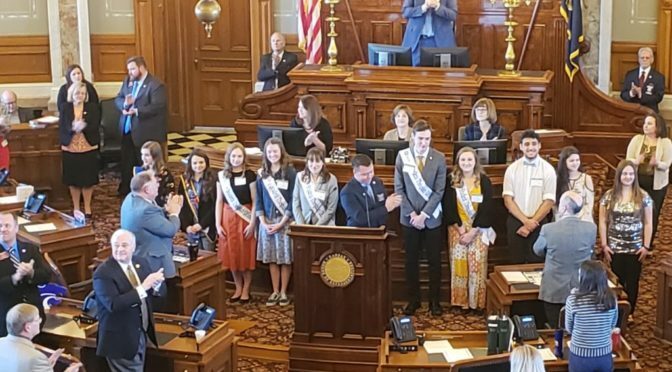 They entertained the state house with a rendition of “This is Me” from The Greatest Showman with junior Mackenzie Peoples singing in the main ensemble. 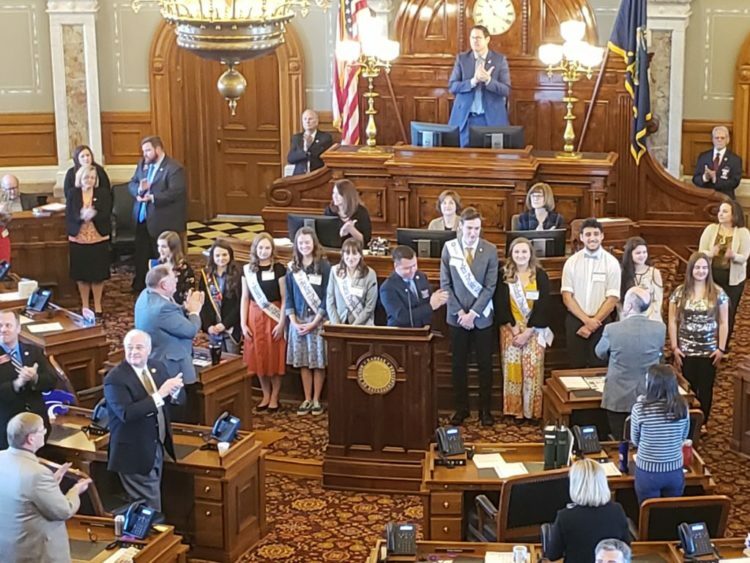 State Thespian Officers, including junior Mesa Jones from FSHS, presented to the House of Representatives, recognizing the importance of theatre education in our schools. 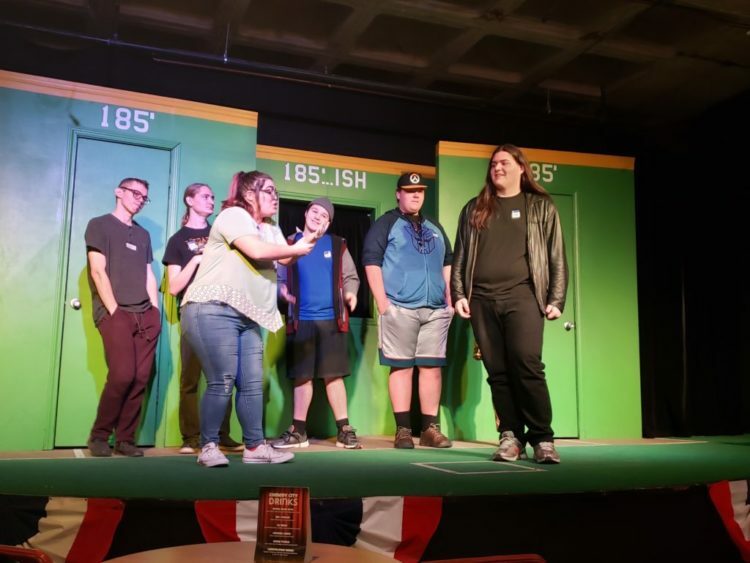 The Thespian Improv Troupe performed at Comedy City in Kansas City, MO at Operation Show twice in March. FSHS also presented the spring play “The Curious Savage” on the high school stage on March 15 and 16. 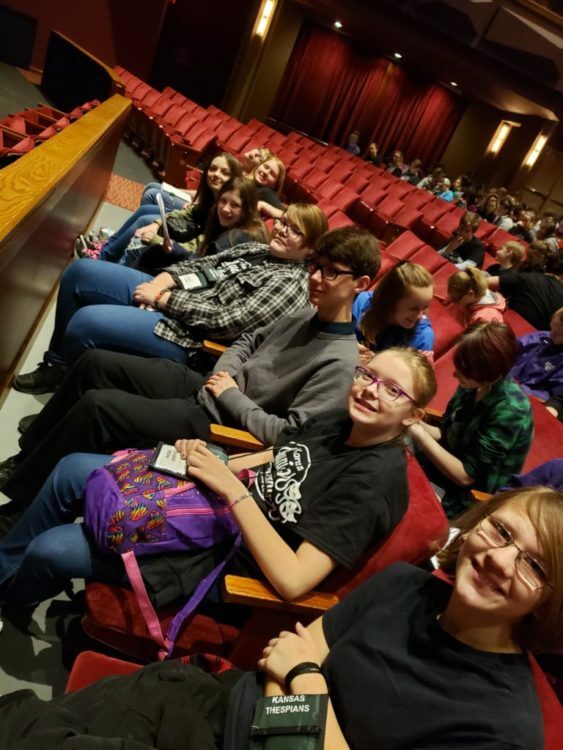 Additionally, this past weekend, troupe director Angie Bin took Fort Scott Middle School students to the KS Jr. Thespian Festival at Johnson County Community College where they attended workshops and watched an Improv Show by Comedy City. Bin and sophomore Sage Hill led five sessions of a workshop entitled, “Unlocking the Mystery of Immersive Theatre” featuring the script FSHS students wrote for the Fort Scott Haunted Trolley Tours in the fall. FSHS is the home of ITS Troupe 7365, the nationwide high school drama honorary society planning TIOS activities. TIOS is a chance for students, parents, communities, school boards, and elected officials to become familiar with the benefits of school theatre participation, which include development of the 21st century skills of communication, collaboration, creativity, and critical thinking. 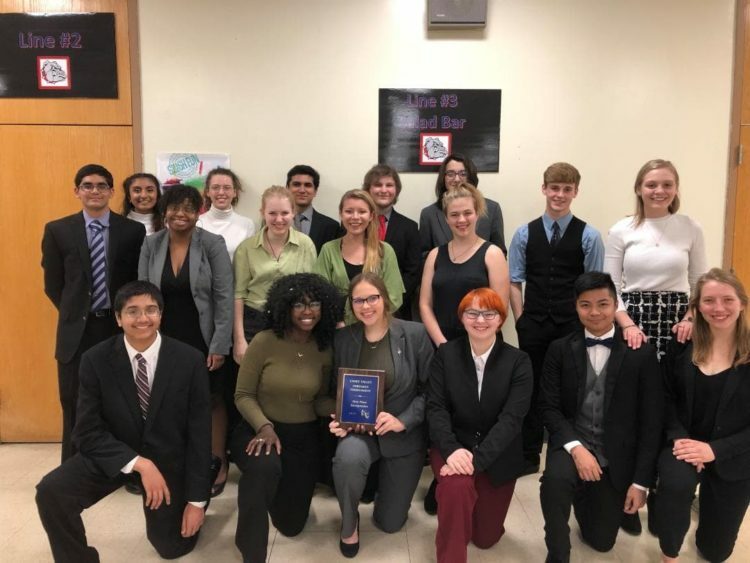 To see ITS Troupe 7365, and the FSHS drama program in action, come to the next performance, of the Improv Troupe Comedy Night on April 27 at 7 p.m. You can also support the troupe by donating to their annual FSHS Thespian Rummage Sale which takes place on Apr. 19 from 8 a.m. to 5 p.m. and Apr. 20 from 8 a.m. until noon on the high school stage (please enter through the NW doors). Donations can be brought to the high school or you may contact Bin for pick-up. The troupe performs their original one-act plays featuring fractured fairy tales on April 29 at 7 p.m. in the HS Auditorium, followed by The Golden Thespie Awards Banquet. Young community members can experience the chance to be a thespian themselves at the Tiger Drama Camp on May 28 through June 7. Registrations are available at Buck Run. More information on all events is available at the Fort Scott High School Thespian Facebook page. Theatre in Our Schools Month (TIOS) is a grassroots effort to educate everyone about the benefits of having theatre in the schools, and to draw attention to the need for more access to quality programs for all students. The campaign is jointly sponsored nationally by the American Alliance for Theatre & Education (AATE), the Educational Theatre Association (EdTA), and the International Thespian Society (ITS). #TIOS19 and #TheatreinOurSchools on social media. FSHS Thespians visit the capitol for Theatre Education Advocacy Day. Back row (l to r): Ivy Bailey, Carlee Studyvin, Ashanti Green, Sage Hill, Angie Bin. Front (l to r): Trevor Jacobs, Mackenzie Peoples, Christina Ramirez, Wynnter Snyder (PSU student teacher). FSMS attends the Jr. Thespian Festival: (l to r) Cadence Tuck, Italeigh Harding, Lexi Hill, Kaitlyn Leavell, Sage Hill (FSHS), Elizabeth Moore, Beana Moore. FSHS Thespian Improv Troupe performs at Operation Show at Comedy City in KCMO. L to R: Devin Stanley, Mason Moore, Christina Ramirez, Anthony Russo, Dominic Cannon, Jo Goodbody. FSHS presents “The Curious Savage.” Above (L to R): Addy Labbe, Mary Gladbach, Hunter Adamson. Below ( L to R): Mary Gladbach, Dominic Cannon, Alyx Brooks, Jo Goodbody, Daniela Belcuore, Sage Hill, Karina Kantilal. 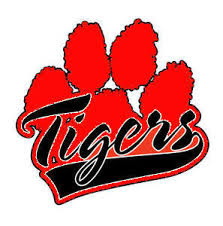 Fort Scott Talking Tigers competed at Caney Valley Tuesday March 26. Fort Scott took 1st place in Sweeps!